If you are reading my blog posts, you will know that I have taken an interest in Japanese kitchen cutlery. I am by no means an expert on this centuries old subject, but rather a student, like I am in all things. As a part of my study I have put together this page which may be of benefit to other newbie knifemakers who want to learn and bit more or make one of these knives. It has been said that in Japan there is a knife for every use. Over the past year I have come to know several dozens of different kinds of knives, some with obscure purposes like breaking down squid or slicing giant tuna. On this page I hope to introduce a few of the basic forms of knives and their key uses. You certainly do not need 40 different knives in your kitchen, but knowing something about the common ones will help in deciding which two or three you'd really make use of. 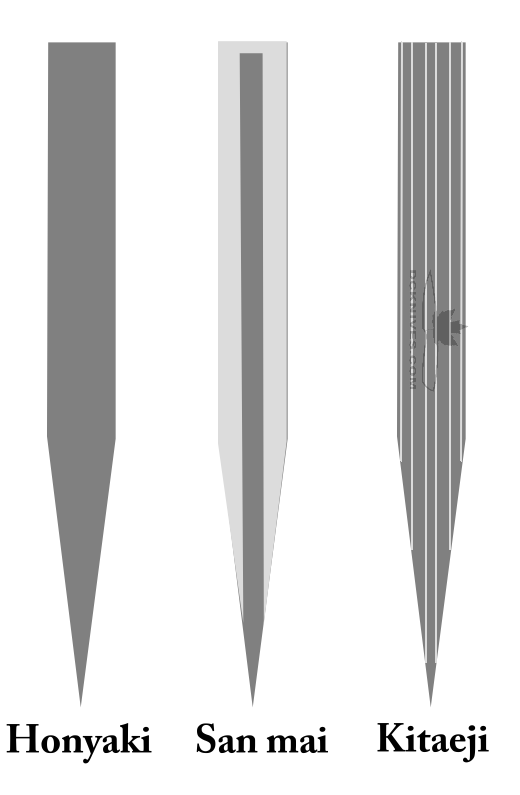 Japanese cutlery steel appears with variety of construction techniques, but common are single steel or honyaki, three layer or san mai and multi-layered kitaeji. Honyaki is a single steel construction. Modern single steel knives are high carbon steel like blue #2 or white #1. These steels are favoured for their hardness and ability to take a very sharp edge. They are however, reactive; meaning the steel reacts (stain) with food acids, water, oxygen etc. Honyaki can be also a stain resistant alloy such as the popular VG10 steel. 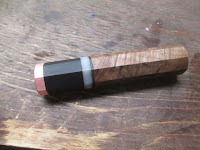 With the former reactive high carbon steels, a patina is used to protect the blade. In this case, a patina is an intentional stain that becomes a protective layer on the steel. It is important that the patina remains on the knife blade as it is said to prevent the blade from imparting a metallic taste into the foods that it comes in contact with. San mai in modern applications is a lamination of high carbon (white or blue steel) core with a corrosion resistance covering. Only the cutting edge of the hard high carbon steel is exposed. The stain resistant steel covers almost all the the blade and this reduces corrosion. The blade may be made more flexible by having both soft and hard steels in one blade. Kitaeji is steel of many layers (also known as Damascus steel). It is often regular high carbon steel and an alloy containing nickel or chromium. The different steel is layered and forged together, then folded repeatedly during forging to produce many layers and interesting patterns. The blade is etched in acid to darken the carbon steel. 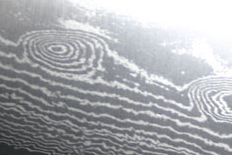 The alloy steel doesn't darken and the result is a striking grey/black/silver pattern in the steel. Not directly related to the steel construction but rather the treatment of the steel is the eye-pleasing hamon. Hamon is an effect on the blade produced by different rates of cooling during the quenching process. 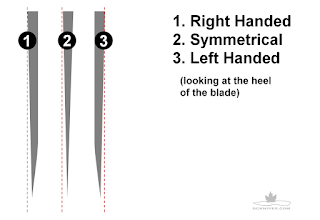 Often created to be a wavy pattern, it defines the boundary of harder and softer areas of the blade. 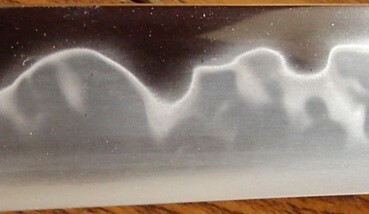 One technique used to make a hamon is to apply clay to the spine of the knife. When it's being quenched, the clay slows the rate of cooling and the distinct pattern is created between the fast cooling and slow cooling areas. In general, Japanese knives are harder than typical Western knives. Expect a Japanese knife to be in the Rockwell 60 to 64 C range. This is very hard compared to a Rockwell 55 to 58 likely to be found in popular German made kitchen knives. Another noticeable difference between Japanese and Western knife styles is the blade and cutting edge geometry. It's not unusual to find blades with a single grind, that is flat on one side and a chisel or convex grind on the opposite side. 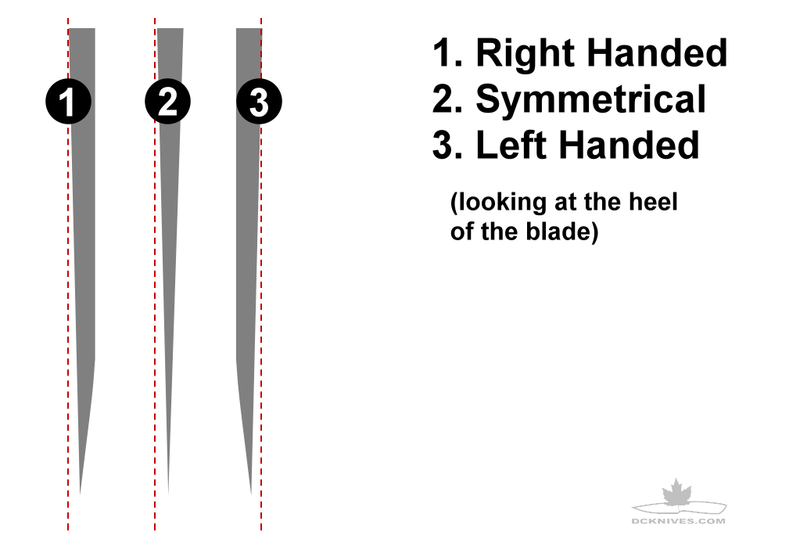 Equally interesting is the asymmetrical grinding of blades for left-handed and right-handed use. Edges are commonly "zero grinds" which means the primary bevels meet at the cutting edge. 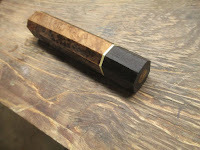 This is like the popular Scandinavian or "Scandi" grind where there is also no secondary bevel. 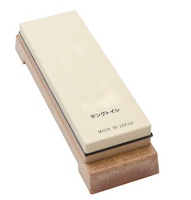 Along with this hardness and edge geometry comes a different way of sharpening too. Harder steel means the use of stones and ceramics to sharpen, vs. the steel that is common the Western kitchens. Honing is accomplished by holding the blade against the stone at the correct angle of the "face." When a westerner thinks of Japanese blades, we likely think of a Samurai sword or the popular Santoku style kitchen knife. Of course these are items that have made it into the western psyche, but many more styles of knives are making their way into our kitchens. Here is a short list of popular Japanese knives that may be of interest to the knifemaker or chef. Gyuto - Essential all-purpose chef's knife. Gyutos are the Japanese equivalent of the European Chef's knife. In general these are lighter, thinner and are harder than their European counterparts. As with most Japanese kitchen knives, they will come with either the traditional 'wa' handle or a western style handle with rivets. Sujihiki - Slicing knife. 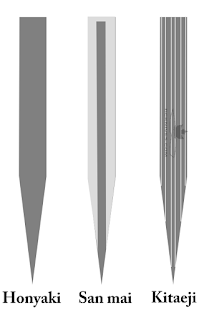 Long blade, typically 200mm (8") or better. Suitable for carving boneless meats such as roasts. Petty - A utility knife. With a wide range of blade sizes from 75mm (3") to 200mm (8"), suitable for paring, detail cutting and general kitchen work. Typically single grind. Works well on the cutting board or in the hand. Santoku - Similar to a chef's knife, but usually shorter with a rounded tip. The blade is normally less than 200mm (8") and double ground. Kiritsuke -A large single grind multi-purpose kitchen knife having a angled chisel or diamond shaped tip. Often stylized with its double grind cousin the Gyuto. Nakiri - A vegetable knife with a rectangular blade like longer thinner cleaver. A thin blade and low angle grind for slicing is the hallmark of a good Nakiri. Chukabocho - A Japanese term for the classic Chinese cleaver. A heavy-duty, general purpose kitchen cleaver with a double ground blade between 180 to 200mm (7 to 8"). Again, this is a short list. Unless you are going to be breaking down eel or doing some specialized cutting, this should be more than enough for any home chef. From a knifemaker's perspective, I'd say that being able to make each of theses would be a great achievement. Wa - A traditional Japanese handle either round, hexagonal or octagonal, often made with a horn ferrule and a hardwood handle. Wa handles are offered in a huge array of materials and the beautiful combinations are endless. Author's wa made from (L to R) copper, ebony, synthetic stone (Corian), vulcanized fiber spacer and stabilized maple burl. Western Style - A handle consisting of two scales and rivets to attach the scales to the tang. The scales are commonly woods such as pakka wood, chestnut, ho wood or ebony and of course the kitchen tested synthetics like Corian or Micarta. The front of the handle often has a bolster made of stainless steel not unlike those found in quality German kitchen knives. A saya is a protective sheath or covering for a knife or sword. Traditionally made of wood, it fits over the blade and protect both the blade and those handling it. Sometimes the blade is secured with a saya pin. The author's KN12 Sujihiki knife in oak saya with pin. Thanks for your blog post! I'm especially interested because I'm trying to learn more about an old kitchen knife recovered from storage. From its shape, it appears to be a right-hand cut Gyoto knife. Would you be willing to help me try to ID it? I can provide measurements and pictures if helpful (there's text on both sides of the blade that might help ID it). Thanks!